The Residence is located in San Polo square. Steps away from the famous Rialto Bridge and 10 minutes walking from St Marco Square. 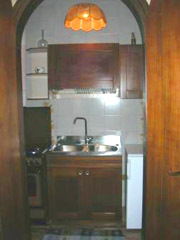 The flat has been restored and decorated in typical venetian style, with Murano lamps and is about 85 qm. The windows look into a canal and into a private old square. Access on the ground floor by a private entrance. On the upper floor there is a fully equipped kitchen, with a connecting living room. A very spacious corridor connects the rest of the flat and opens onto. The two sleeping rooms and onto the bathroom. The two doubles rooms are furnished in Venetian Style with Murano Lamps. The windows overlook into a canal and into a private old courtyard. From the international airport Marco Polo You can use the service, motorboat Alilaguna to get off at the Fondamenta Nuove. Passing through the foundations by crossing the three bridges, turn to the right into Calle delle Capucine. After less than a hundred meters turn right into the Branch Moschetti ... and You have arrived! From the railway station or Piazzale Roma You have to take the boat line number 52 and get off at the Hospital of San Giovanni e Paolo. Passing the foundations left, Calle delle Capucine is a few meters on your right and shortly after turn right again for the Branch Moschetti ... You've arrived! We'll be happy to arrange for You a free transfer, by waiting for You by the boat stop to accompany You to the apartment.